Kemdent recently conducted a customer survey amongst its many regular Diamond Carve customers to find out exactly what they thought about it, and to see if it needed any changing in order to make it even more user friendly and appropriate to use. The answer was a resounding no, with the vast majority of customers saying that it was perfect in virtually every aspect. Finally, it has the ideal strength for its recommended indications and is supplied in an adequate range of shades, which each accurately match the stated Vita shade. Most of the responders use Diamond Carve for restoring deciduous teeth and for semi-permanent posterior restorations in adults. However, it is also extensively used as a core build-up material and in the sandwich technique. Easy to finish, they felt Diamond Carve had the optimum level of radiopacity for each of these indications. Finally, with a three-year shelf life the responders stated that Diamond Carve represents good value for money and that they would definitely recommend it to other dentists. The globally binding Minamata Treaty on the use of mercury, which was signed in October 2013, means dentists need to find a suitable alternative to dental amalgam. There are many to choose from, all with their own relative merits, but many believe that Kemdent’s Diamond Carve offers an extremely user-friendly and cost-effective option worthy of serious consideration. What makes Diamond Carve special? 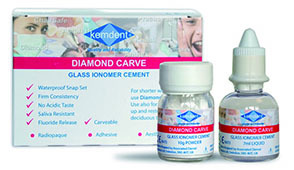 Kemdent first introduced the Diamond glass ionomer cement (GIC) range to the dental market in March 1999. Now 19 years later the Diamond range is one of the world’s leading GICs used daily by literally thousands of dentists in over a dozen countries worldwide. Diamond provides dentists with a clinically proven GIC restorative material that effectively performs highly aesthetic restorative procedures, replacing traditional composite, and amalgam methods of working. Chemical curing, without dimensional change, means Diamond restorations can be placed in one increment, saving time and avoiding the creation of stresses within the restoration that can be caused by incremental build up using composites. Both of these advantages also contribute to its relative lack of postoperative sensitivity compared with bonded composites. Fluoride release is another significant advantage. Diamond is also far less susceptible to moisture around the operating site, partly due to its rapid chemical snap set and its mercury-free composition. It quite categorically adheres to both enamel and dentine, without the need for acid etching – saving time and additional expense. Finally, there is no polymerisation shrinkage and consequent cracking associated with Diamond. The innovative Diamond range allows dental practices to perform various styles of chairside treatment. The firm consistency of the Diamond GIC range allows easy placement of the materials and rapid ‘snap setting’, matching tooth colour in just over two minutes at normal room temperature. Gone are the days of sending away patients with poorly aesthetic, opaque, moisture sensitive restorations, with instructions to return a week later for polishing, hoping that when they return the restoration would not have a crazed appearance and have been weakened by moisture contamination. With a three-year shelf life the responders stated that Diamond Carve represents good value for money. Diamond Carve is a hand-mixed glass ionomer cement for posterior indications including non-load bearing class I and II restorations, together with class V abrasion cavities. It can also be used for restorations in deciduous teeth, core build-ups, amalgam repairs – where it helps minimise the health risks associated with the removal of old amalgam restorations, and the cementation of posts in root canal restorations. Diamond Carve Powder is made from alumina-silicate glass containing calcium fluoride as well as strontium and barium for radiopacity, plus a number of dry acids to enhance the setting reaction. Diamond Carve Liquid is a water-based acidic solution. They are combined together in a 4:1 ratio, with one scoop of powder to one drop of liquid. Setting occurs through an acid/base reaction. Diamond Carve is self-adhesive to both enamel and dentine. In addition to its inherent calcium fluoride content, it also acts as a fluoride reserve where it can reabsorb fluoride from mouthwashes, toothpastes, or many other sources of fluoride and then gently release it in a low and controlled concentration. Therefore, it offers the added benefit of long-term fluoride release. Available in seven aesthetic shades, an immediate advantage over ‘dirty old amalgam’, it is manufactured from a special GIC, which contributes to a range of features including versatility and strength. With a 350MPa compressive strength Diamond Carve is up to 50% stronger than other glass ionomer cements, saliva resistance, excellent finishing and wear resistance properties. In addition to this, tests have proven that there is no dimension change during the setting reaction and no postoperative sensitivity. These advantages, together with its packable consistency, durability and ease of use make it the ideal aesthetic alternative to amalgam. Diamond Carve has a working time of between two and two-and-a-half minutes and a setting time between three minutes 40 seconds and four minutes. It requires minimal preparation, simply the requirement to remove soft caries and undermined enamel, with no varnishing afterwards. It adheres to dentine and enamel without the need for any preparation of the tooth surface or a bonding system, thereby saving valuable surgery time and additional expense compared with composite materials. The cement becomes rapidly carvable, and offers a ‘waterproof’ chemical snap-set. To see a short ‘How to use Diamond Carve’ video demonstrating the mixing and handling of Diamond Carve. Diamond Carve is not only the ideal alternative to Amalgam it is a low cost/ high margin product. The continued use of mercury rich dental amalgam has been controversial for decades, but now the globally binding treaty on the use of mercury, which was signed in Japan in October 2013, has ultimately signed its death knell. Whilst this won't happen overnight, it means dentists will all need to find a suitable alternative. 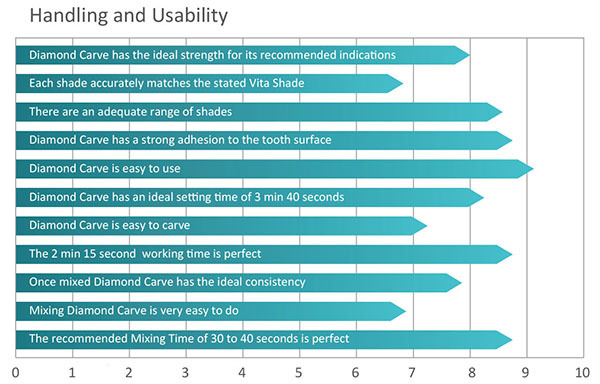 There are many to choose from, all with their own relative merits, but many believe that Kemdent's Diamond Carve offers an extremely user friendly and cost effective option worthy of serious consideration. "I use Diamond Carve because it is easy to mix and you can mix the exact quantity you require. There is no waste. I also like the way it bonds well to the tooth and is a lot harder than other Glass Ionomers, therefore, it lasts longer." "I use Diamond Carve to restore primary teeth and class Vs in adults, where the restoration is held in place and shaped using a metal cervical foil, which gives a very smooth finish after the initial snap-set." Quote from Dr John Rees - Rees Dental Practice, Birmingham. Packaging: 10g Powder, 7ml Liquid / Full Kit 5 x 10g Powder & 1 x 25ml Liquid. Talk to our qualified sales team about Kemdent's high quality UK manufactured products available at competitive prices! Learn how to use Diamond Rapid Set GIC (Glass Ionomer Cement) Capsules ideal for the busy Dental practice. The continued use of mercury-rich dental amalgam has been controversial for decades, but now the globally binding treaty on the use of mercury, which was signed in Japan in October 2013, has, ultimately, signed its death knell. Whilst this won’t happen overnight, it means dentists will all need to find a suitable alternative. There are many to choose from, all with their own relative merits, but many believe that Kemdent’s Diamond Carve offers an extremely user-friendly and cost-effective option worthy of serious consideration. Kemdent first introduced the Diamond glass ionomer cement (GIC ) range to the dental market in March 1999. Now,15 years later, the Diamond range is one of the world’s leading GIC’s used daily by thousands of dentists in more than a dozen countries worldwide. Diamond provides dentists with a clinically proven GIC restorative material that effectively performs highly aesthetic restorative procedures, replacing traditional composite, glass ionomer and amalgam methods of working. Chemical curing, without dimensional change, means Diamond restorations can be placed in one increment, saving time and avoiding the creation of stresses within the restoration that can be caused by incremental build-up using composites. Both of these advantages also contribute to its relative lack of post-operative sensitivity compared with bonded composites. Fluoride release is another significant advantage. Diamond is also far less susceptible to moisture around the operating site, partly due to its rapid chemical snap-set and its healthier, mercury-free composition. It quite categorically adheres to both enamel and dentine, without the need for acid etching – saving time and additional expense. Finally, there is no polymerisation shrinkage and consequent cracking associated with Diamond. The Diamond range allows dental practices to perform various styles of chairside treatment. The firm consistency of the Diamond GIC range allows easy placement of the materials and rapid “snap-setting”, matching tooth colour in just over two minutes at normal room temperature. Gone are the days of sending away patients with poorly aesthetic, opaque, moisture sensitive restorations, with instructions to return a week later for polishing, hoping that when they return, the restoration would not have a crazed appearance and have been weakened by moisture contamination. There are various options available, including Diamond Carve and Diamond Rapid Set capsules. Diamond Carve is a hand-mixed glass ionomer cement for posterior indications, including non-load bearing class I and II restorations, together with class V abrasion cavities. It can also be used for restorations in deciduous teeth, core build-ups, amalgam repairs – where it helps minimise the health risks associated with the removal of old amalgam restorations, and the cementation of posts in root canal restorations. Diamond Carve Powder is made from alumina-silicate glass, containing calcium fluoride as well as strontium and barium for radiopacity, plus a number of dry acids to enhance the setting reaction. Diamond Carve Liquid is a water-based acidic solution. They are combined together in a 4:1 ratio, with one scoop of powder to one drop of liquid. Setting occurs through an acid/base reaction. Diamond Carve is self-adhesive to both enamel and dentine. In addition to its inherent calcium fluoride content, it also acts as a fluoride reserve, where it can re-absorb fluoride from mouthwashes, toothpastes or many other sources of fluoride, and then gently release it in a low and controlled concentration. Therefore, it offers the added benefit of long-term fluoride release. Available in seven aesthetic shades, an immediate advantage over “dirty old amalgam”, it is manufactured from a special GIC which contributes to a range of features, including versatility and strength – with a 350MPa compressive strength, Diamond Carve is up to 50 per cent stronger than other glass ionomer cements; saliva resistance; excellent finishing; and wear resistance properties. In addition to this, tests have proven that there is no dimension change during the setting reaction and no post-operative sensitivity. These advantages, together with its packable consistency, durability and ease of use, make it the ideal aesthetic alternative to amalgam. Diamond Carve has a working time of two minutes-two minutes and 30 seconds, and a setting time of three minutes and 40 seconds-four minutes. It requires minimal preparation, simply the requirement to remove soft caries and undermined enamel, and no varnishing afterwards. It adheres to dentine and enamel without the need for any preparation of the tooth surface or a bonding system, thereby saving valuable surgery time and additional expense compared with composite materials. Carvable, it offers a “waterproof” chemical snap-set. Step 1 – select the appropriate shade. When placed, the fresh cement is opaque. Translucency develops over the first couple of weeks. Step 3 – clean the cavity with water and gently dry. Remove smear layer by applying Kemdent Diamond Carve liquid for 15 seconds using a cotton pellet. Wash and gently dry. Using a plastic spatula, mix half of the powder with the liquid to form a smooth, creamy paste. Then, mix in as much of the remaining powder as possible to form a firm, putty-like consistency. Do not make it dry or crumbly. In the case of multiple scoops of powder, incorporate each, in turn, into the liquid, making sure the final cement has a smooth and firm consistency. It should take approximately 30-40 seconds to mix them together. Due to Diamond Carve’s snap-set and to achieve good adhesion to the enamel and dentine, always mix fresh material for each cavity. Step 6 – place the mixed material into the cavity and pack into place using conventional packing instruments. Diamond Carve has a firm, putty-like consistency, which makes it easy to pack. Once placed, carve as desired. The working time from start of mixing is approximately two minutes and 15 seconds. Diamond Carve has a snap-set after three minutes and 40 seconds, which quickly makes the restoration water resistant. Step 8 – as a precaution, instruct the patient not to bite on the restoration for about one hour. Dr John Rees, from Rees Dental Practice, Birmingham, commented, “I use Diamond Carve because it is easy to mix and you can mix the exact quantity you require. There is no waste. I also like the way it bonds well to the tooth and is a lot harder than other glass ionomers, therefore, it lasts longer. “I first started using Diamond 90 in 1999 because I quickly recognised how it could help me cut down on treatment time and successfully provide more aesthetic results for my patients. However, I now use Diamond Carve as my preferred choice of restorative material. Prior to using Diamond, restorations were often time-consuming and work intensive. They could take up to 40 minutes in total for a large cavity. By using Diamond Carve, I have reduced this time dramatically”. Find out how to use Kemdent's Diamond Carve a restorative material with a performance unmatched by any conventional Glass Ionomer Cement. Extremely durable, hard wearing, strong and versatile.